All of these rabbits came from Duchess and Duke (different litters) and are pet quality only. They are very sweet and would love to come to your house! Please contact me for pricing. Sales: Cash only. I have the right to refuse any sale. All sales are final. If you cannot care for your rabbit after taking it home, please contact me. Before you buy a rabbit here are some things you will need: A cage (preferably 20"x20" for a Mini Satin), a water bottle, a feed dish, Timothy Hay, and feed. I will supply you with about 1-2 weeks of feed to get you started. Guarantee: I will make sure the rabbit has been cared for to the best of my ability. I operate a very clean rabbitry. 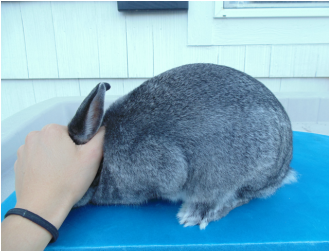 Each rabbit is handled almost daily so they will be friendly for their new owner! With each rabbit I will include a "How to Take Care of My Rabbit" information paper (see below) so you will know how to give your new rabbit the best of care. Show Quality: I cannot guarantee that a rabbit bought for show purposes will not be disqualified. 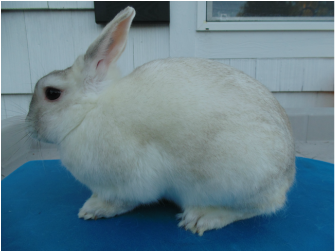 I will inform you, to the best of my ability, how a Mini Satin is shown and which rabbit, out of the litter in question, is the best show quality.